Hey hey! Any of you fine folks going to be at this weekend's Anime Expo in Los Angeles? Because I am! If you're going to be at the show, you can find me hanging at the Topatoco booth (Booth 4018), along with my pal David from Wondermark. 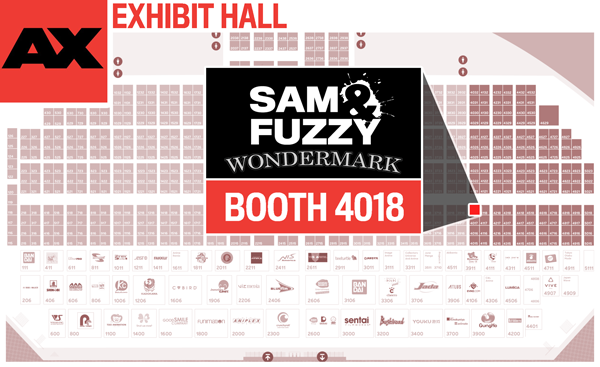 I'll be drawing and signing stuff, and I hear there will be a wide selection of Sam and Fuzzy paraphenalia at the booth... including the new books! Hope to see some of you there. Come back on Monday for our next comic. See you then! You recognize those eyebrows, right? Sure you do! It's been a long time since the days when Sin wore 'em -- which were way back when he was president of Sin Records -- but as we discussed in this here Q and A, those were also the days that he was paling around with Theo Designer. Speaking of Q and A, there won't be one this week, since I'll be down in LA checking out Anime Expo. But there will be a new comic on Friday, so be sure to tune in for that!